Mirror, mirror. This is a team development room in Boston. It’s connected via a series of high-res video cameras and massive arrays of microphones to an identical room in Sonos’ Santa Barbara, CA location (seen on the flat screens). Like mirror images of one another, teammates can use the cameras to see each other, but more importantly, to zoom in on any hardware item that occupies the work bench. The members at each location are considered part of one team. Early Playbase prototype. The Playbase’s early, L-shaped design shows how the team initially thought of placing the primary speaker grilles on a vertical surface. Presumably the TV would still have sat on the flat portion of the enclosure, but with the controls mounted as seen here, they would have been hard to reach. Another prototype. This time you can see the change to a completely flat design. Clearly the team had given some thought to providing a few more inputs than the single Optical port the final Playbase received. Will it fit? One of the challenges involved in creating a speaker with as many drivers as the Playbase is whether or not you can fit all of the components you need to achieve the sound you want. That starts by creating the mock-up you see here: It’s not much to look at, but it contains the bare minimum features needed to produce the right sound, including a bass reflex port. Better call SOL. 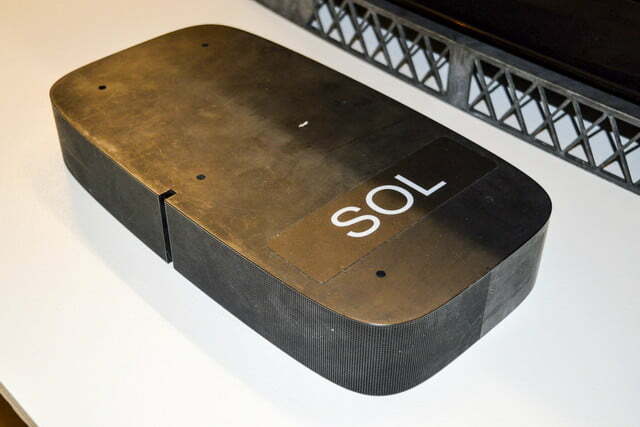 Bearing the Playbase’s internal codename (SOL), this was an early attempt to find a plastic enclosure design that could support itself without an interior metal skeleton, while expressing what would become the final aesthetics of the product. Despite being a prototype you can already see how much emphasis was placed on a seamless design. All about da bass. At the heart of the Playbase Sonos’ custom-designed subwoofer. 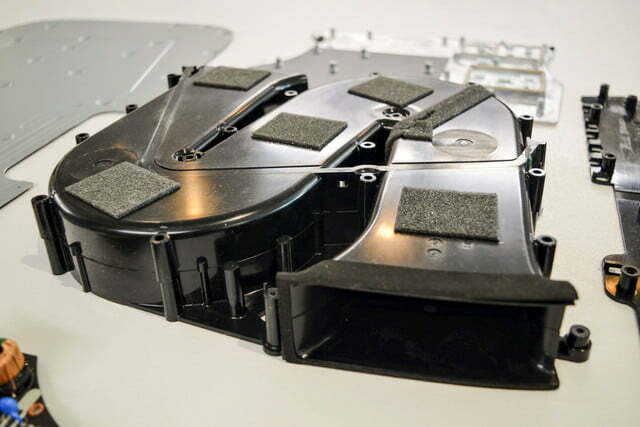 The team needed a driver that could move enough air to sound rich and full, yet thin enough to fit inside the speaker’s incredibly short vertical height. Nice curves. 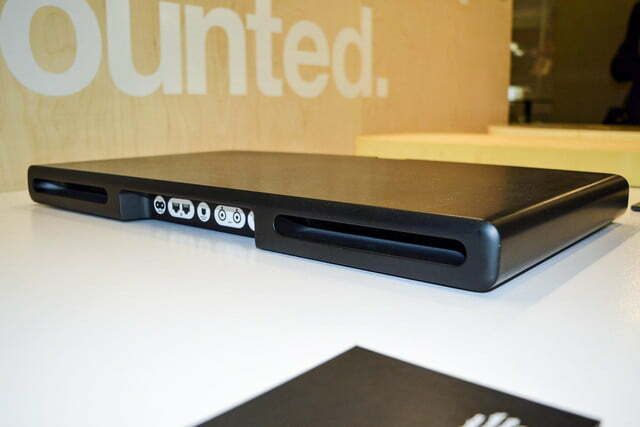 This is the S-curve port that Sonos engineered specifically for the Playbase. It’s tuned to maximize the amount of bass exiting the enclosure while navigating extremely tight internal dimensions. Total destruction. 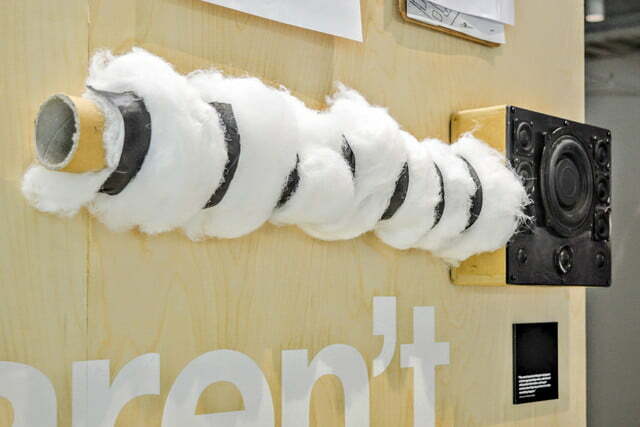 This audio torture chamber is where Sonos speakers come to die. The company loads up this cart and connects its products to a series of sensors. Everything is cranked to maximum volume and left to play in this fully isolated chamber, 24 hours a day, 7 days a week until failure. On average, a Sonos SUB can tolerate a full year of this punishment before punching out for good. The source music the team uses to produce such results is a closely guarded secret. Say what? 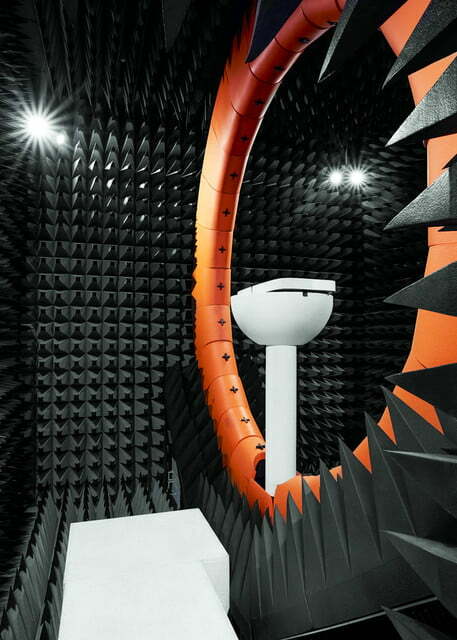 Anechoic chambers are some of the quietest places on the planet. This makes them the perfect place to measure exactly what kind of sound comes out of a speaker. 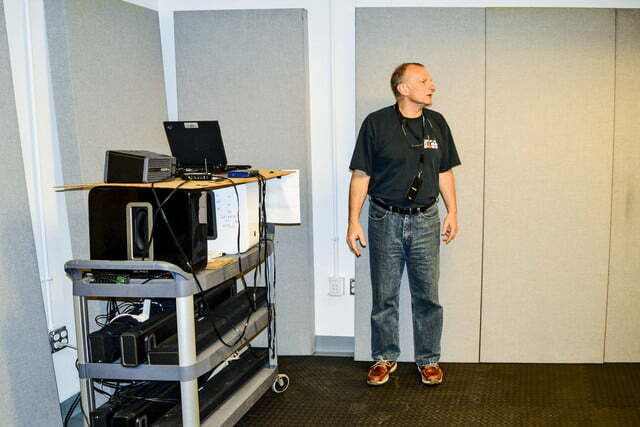 This chamber, which takes up two full floors within Sonos’s Boston location, is actually twice as tall as it appears. Beneath the floor, which is little more than a high-tension wire mesh, is a 10-foot chasm with matching acoustic tiles. It’s so quiet in this room you can hear your own low level tinnitus, something which many folks find unnerving. Despite its ultimate absences of sound, it’s not a great place to listen to music. Listen up. 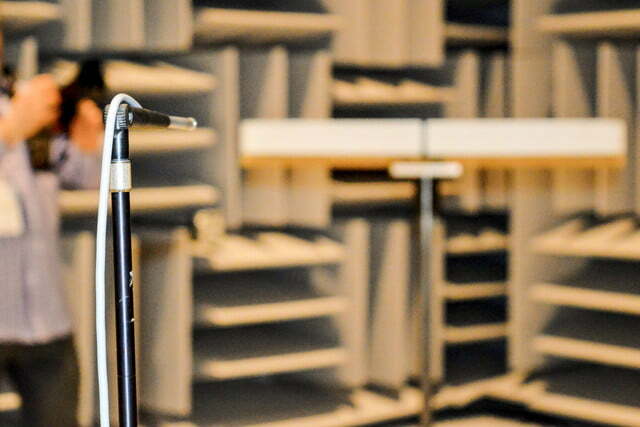 A vibration-isolated directional microphone is aimed at Sonos Playbase inside the anechoic chamber. Red ring of RF. 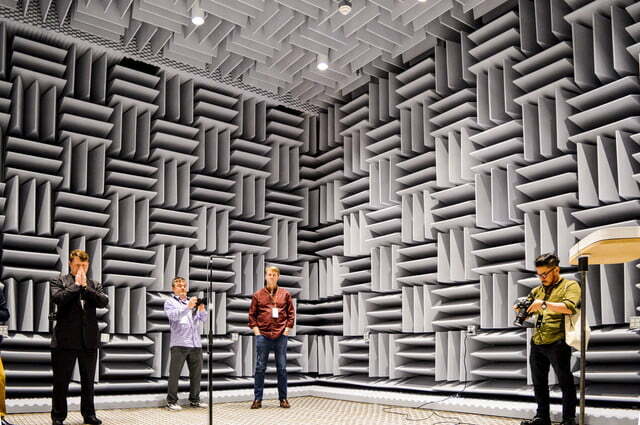 In this 3D RF Anechoic Chamber, which looks like something pulled out of Portal, Sonos products undergo Wi-Fi performance testing. The big orange ring contains 18 antennas that capture a wireless radiation diagram, as the speaker is rotated 180 degrees on its stand. This helps engineers better understand the effect that design changes have on Wi-Fi. 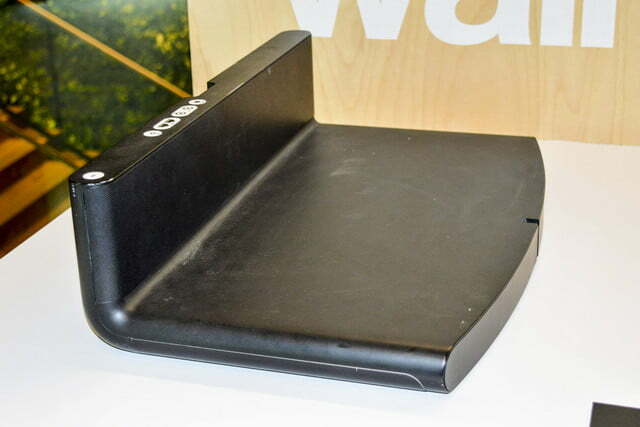 For a product like the Playbase, with its need for strong structural integrity, even small changes to its plastic enclosure could have a significant impact on Wi-Fi. Stop interfering. 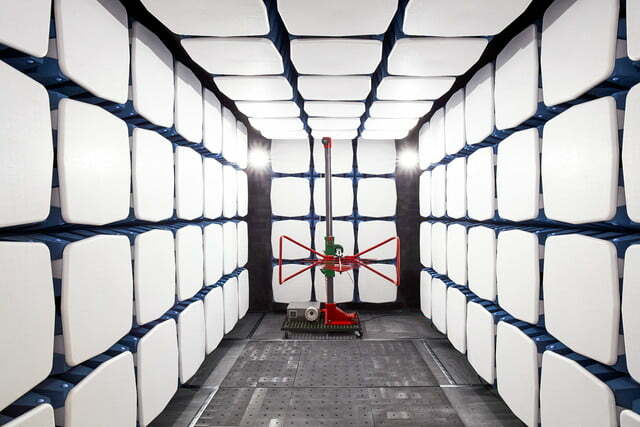 In this chamber, a Sonos product is placed at one end, while a massive antenna sits at the far end. The antenna picks up all emissions created by the product to ensure it complies with FCC and ETC regulations, including measuring for harmful interference. Can’t take the heat? 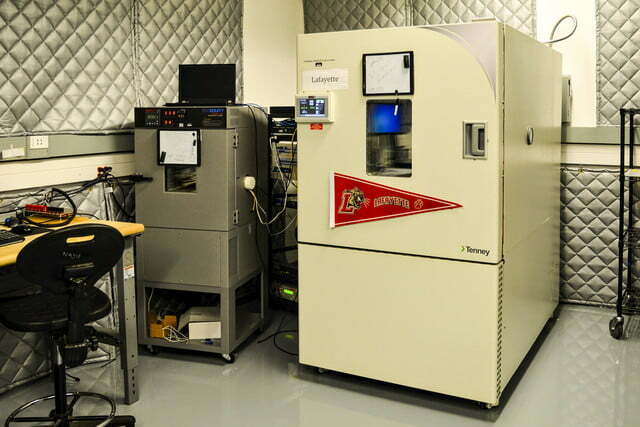 Machines like this one are used to simulate the extreme conditions in which a Sonos product might find itself. 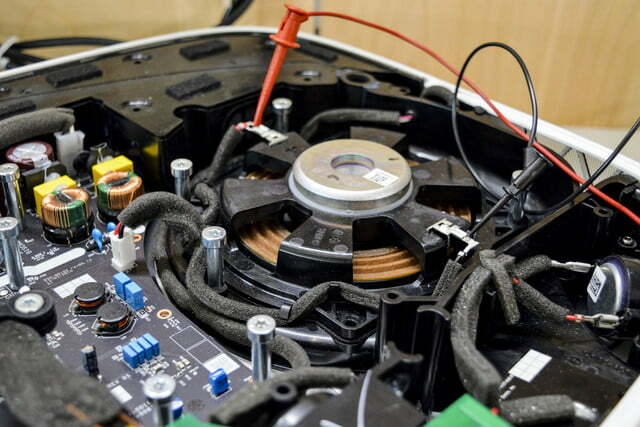 With the ability to control temperature and humidity, the team can approximate the harshest environments on the planet, taking careful note when and how the speakers are no longer able to deal with the punishment. In the highly competitive world of consumer electronics, secrecy tends to be the guiding principle at most companies. Product leaks are avoided at all costs, and valuable intellectual property is guarded like the crown jewels. 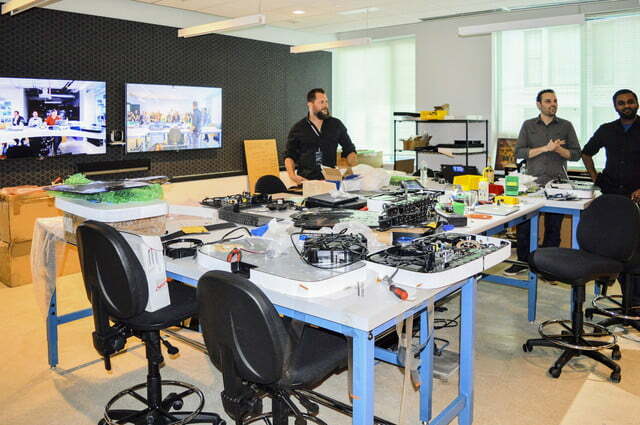 So it was a little unusual that Sonos decided to give a select group of tech writers a deep-dive behind the scenes at its Boston, MA headquarters. The occasion: The launch of the company’s latest product, the Playbase, a $699 alternative to its Playbar, that puts a full home theater kit in a 2.3-inch tall package that sits under, rather than in front of, your HDTV. It took just about four years for the Playbase team to get their product from concept to launch, and they were eager to show off the process. Above is a photo gallery from the launch event, including a detailed exploration of the Playbase development through a look at its various pre-final incarnations, as well as a peek behind-the-kimono at the extensive R&D facilities Sonos uses to create all of its wireless Hi-Fi products.